I have created a new look for above my stove. What do you think? 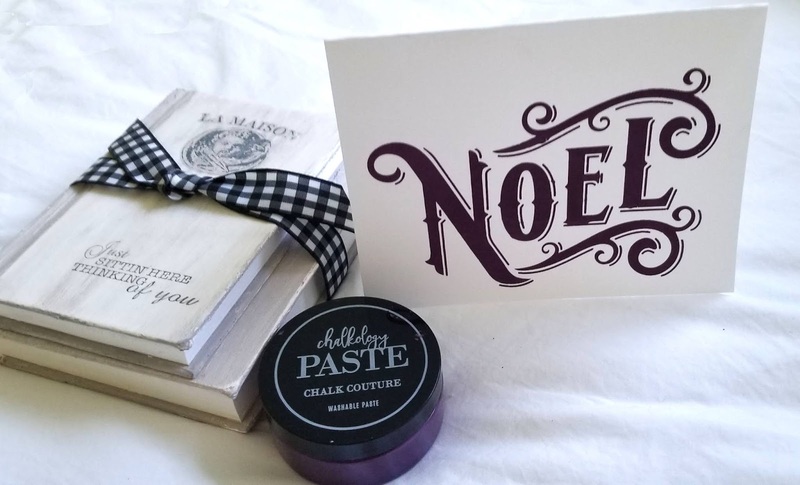 Don't forget, if you would like to try a sample of the Chalk Couture Paste, just email me at jfricker@fourway.net and I will send one out to you. It is so fun and easy. I am finally catching up and had a chance to make some cards this week. Can you believe I forgot to take any pictures. But, things have slowed down here and I plan to get some made so I have them on hand. I am so thankful for my craft room that I can spend my time in being creative. How about you, What are you doing these days? I would love to hear from you! I certainly do miss that part of my business as my favorite thing was talking to my customers. You can join Chalk Couture for only $99.00. I joined to get all the products at wholesale and you can too. You can just be a hobbyist and use the products or start a new business. I am having so much fun with these products as I am able to change the things in my home often with the change of the seasons. If you have any questions, please email me at jfricker@fourway.net or call 574 514 1423. Below is the Designer Kit that you will receive starting April 1. Chalk Couture has introduced many new products that I just love. 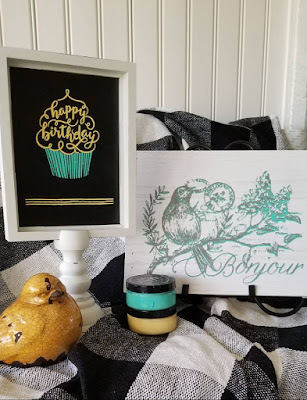 Last week I showed you a card using the Happy Birthday card I made using the Chalk Paste. Today, I am showing you the same transfer on a blackboard frame. I plan to do a Happy Easter one soon for my entry. Chalk Couture's new Spring/Summer Catalog has many wonderful NEW transfers in it. A DISC AND A SMALL SQUEEGEE to try. Just email me at jfricker@fourway.net or text 574 514 1423. I sent Patti Gilliam, a previous customer of mine a sample to try. Isn't this beautiful? AND she loves it!!! If you would like to thumb through the catalog just click below. I needed a quick birthday card for tomorrow, so I used the Happy Birthday cupcake transfer to make this card. I'm telling you card makers, this works great. Chalk Couture is coming to Canada! Designers (Reps) wanted for this young Direct Sales Company that promotes an experience for creating unique, easy, DIY projects that anyone can do! The company is growing at a phenomenal rate in the USA! Now, we're ready to decorate the halls and walls of CANADA! Fantastic compensation plan! Get in NOW! Email me at jfricker@fourway.net for details, or click here for more information or to hold you spot to be one of the first to enroll: https://essentials.chalkcouture.com/canada-pre-registration/. 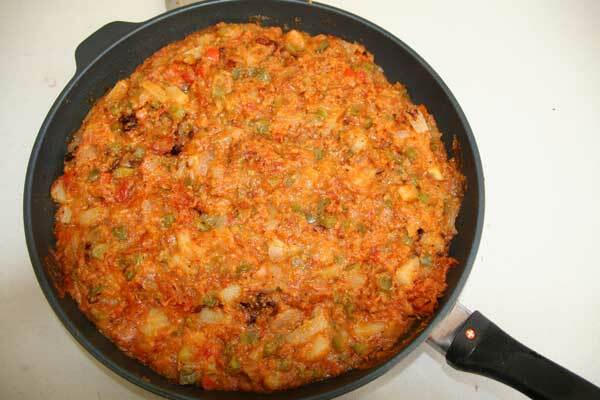 This dish is one of my families favorite meals. And, a meal it is. When my Mom's Mother died some 70+ years ago, one of their Hungarian neighbors prepared this dish for them. We absolutely love it and everything in it is fresh from the garden. hot. 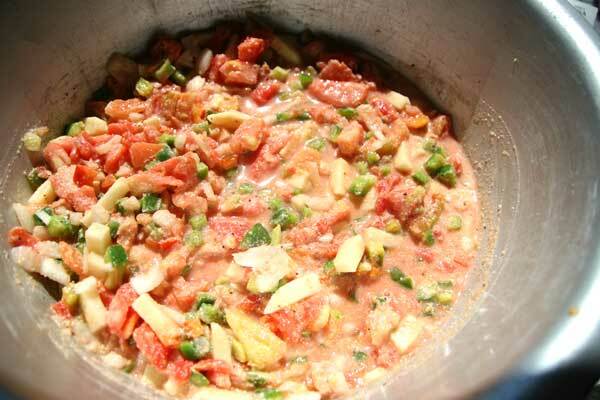 Melt about 1/2 cup lard or part butter. 2. Fry on medium heat turning consistently so it doesn't burn. Best if it browns some. 3. Cool about 1/2 hour before eating. This is time consuming, but so worth it. Over the years, I have worked and worked to get mine as good as Moms. Last week I accomplished it as it turned out just perfect. This is soooo good!!! 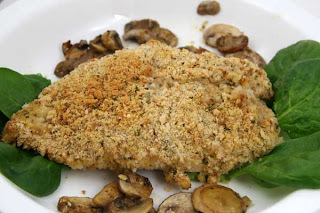 This baked chicken recipe is one of my favorite chicken dishes. Delicious chicken coated in bread crumbs and Parmesan cheese. Sooo easy, but your guests will never know how hard you didn't work! I marinate my chicken and pork chops in butter milk all day. This makes for very moist chicken. Then rinse it dry, and put between wax paper and pound dry so all pieces of chicken are the same size. In a shallow bowl, beat the egg with salt, pepper and 1 teaspoon garlic powder. In a separate dish, mix bread crumbs with 1 teaspoon of garlic powder and Parmesan cheese. Set aside. 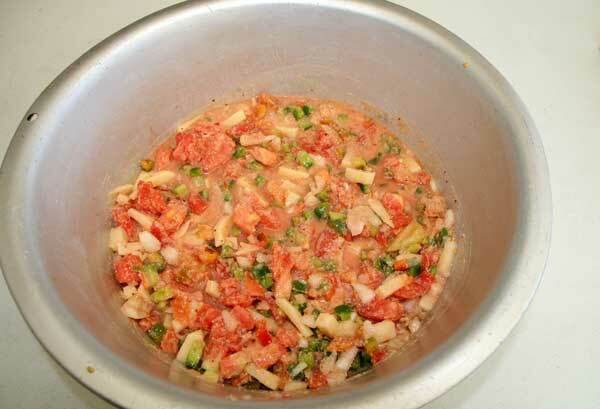 Mix together the melted butter and lemon juice. Pour about 2/3 of the butter mixture into the bottom of a 9x13 inch baking dish. Tilt pan to coat the bottom. Spread mushrooms in an even layer in the bottom of the dish. Dip each chicken breast into the egg mixture, then into the bread crumb mixture. Place on top of the mushrooms. Drizzle remaining butter over the chicken, and sprinkle with parsley. Bake uncovered for 45 minutes in the preheated oven, until chicken is golden brown and juices run clear. Please check back in the morning for my weekly sales. I appreciate you stopping by this evening so very much! This is one of the best cakes I have ever eaten. If you don't want to go to the trouble of making the pineapple flowers, just make a cream cheese frosting and enjoy! A great Easter cake too! Although no one knows for certain, some believe this confection is so named because it’s as sweet as the sugar that water-bird enthusiasts use to attract hummingbirds. Of course, others contend that the name simply came about because it’s easy to envision the hummingbird being unable to resist one of the cake’s most distinctive features: flowers made from dried pineapple. In either case, when cutting the pineapple, remember that the thinner you slice the rings, the faster and more colorful they’ll dry. I finally figued out that they must be paper thin to be pretty. Butter two 9-by-2-inch round cake pans. Line the bottom of pans with parchment paper. Butter the paper and dust pans with flour, tapping out any excess; set pans aside. Whisk together flour, baking soda, cinnamon, and salt into a medium bowl; set aside. 2. Place butter, vanilla, and sugar in the bowl of an electric mixer fitted with the paddle attachment. Beat until well combined, about 2 minutes. Add eggs, one at a time, beating to combine after each addition. Continue beating until mixture is fluffy and pale yellow. 3. In a medium bowl, stir together, banana, pineapple, walnuts, and coconut. Add flour mixture and combine. 4. Divide mixture between prepared pans. Bake until golden brown, and a cake tester inserted in the center comes out clean, 30 to 40 minutes, rotating pans halfway through baking. 5. Transfer pans to a baking rack to cool. Let pans cool 15 minutes before unmolding. Loosen sides with a small metal spatula or a paring knife, and invert onto greased wire racks. To prevent layers form splitting, invert again, so tops are up. Cool completely before assembling cake or wrapping airtight to freeze cake for later. 6. Using a serrated knife, trim the top of one layer (It is ok if the second layer is a bit rounded, for it becomes the top of the cake). 7. To assemble, place trimmed layer on serving platter. Spread the top with 1/4-inch layer of frosting. Top with the untrimmed top layer. Lightly coat the assembled cake with a thin layer of frosting to protect against crumbs in the frosting. Finish with remaining frosting. Decorate with dried pineapple flowers, if desired. 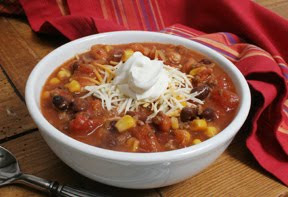 Serve immediately, or keep refrigerated until ready to serve. 1. Preheat oven to 225°. Line baking sheets with Silpats (French nonstick baking mats) or parchment paper. 2. Peel pineapples and remove “eyes” using a very tiny melonballer. Cut crosswise into very thin slices (paper thin) and place in a single layer on prepared baking sheets. Bake until tops look dry, about 4 hours. Using tongs, flip slices over and continue to cook until completely dried out, 25 to 30 minutes more. Cool on a wire rack. Store in an airtight container in the refrigerator up to 3 days. Beat 8 oz. cold cream cheese (not rock solid, but it means you can use it straight out of the refrigerator) with 5 Tbsp. softened butter and 2 tsp. vanilla until combined. Gradually add 2 c. powdered sugar that has been sifted after measuring. Continue to add more sifted powdered sugar until you reach a consistency and sweetness that fits your taste. 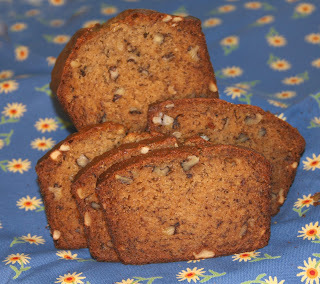 With our weather turning cooler and the leaves almost gone, it is banana nut bread time of year. My Mom who will be 94 next month, created this recipe several years ago. I have yet to find one that I like as good as this one. Let me know if you try it and how you like it! Preheat oven at 350 and bake 1 hour. Sift together flour, salt, soda . Mix well. Beat eggs until foamy, adding sugar slowly. Mix but be careful not to over mix. Add oil, bananas, vanilla, buttermilk and nuts. Add dry ingredients slowly add to above mixture. Mix, but be careful not to over mix. to order this great special. You place the order and it is shipped directly to you via Chalk Couture. You will receive everything you need to make this beautiful design. 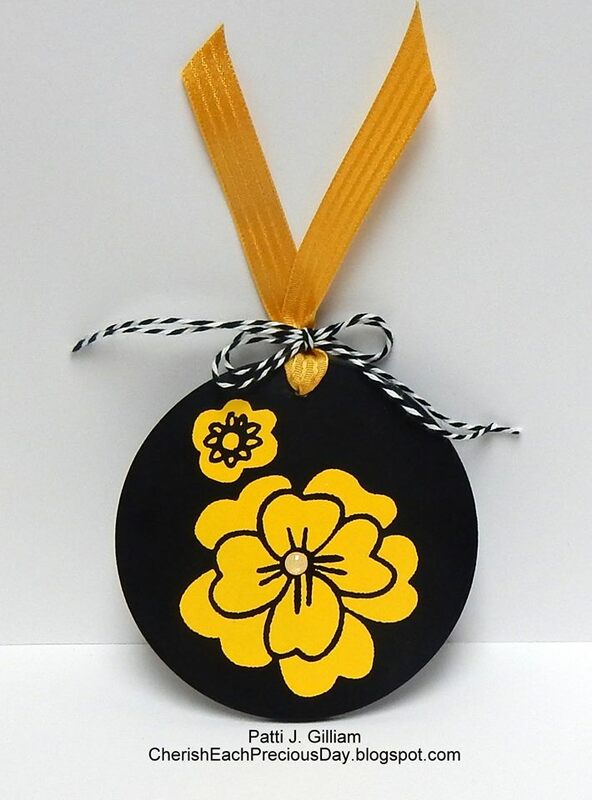 This is a wonderful gift to give a special person too. Don't miss out. Merry Christmas from our home to yours. We had a Christmas Walk last Sunday evening with about 80 attending. It was so fun and I love it doing it. I have had so much fun decorating this year since our remodled. 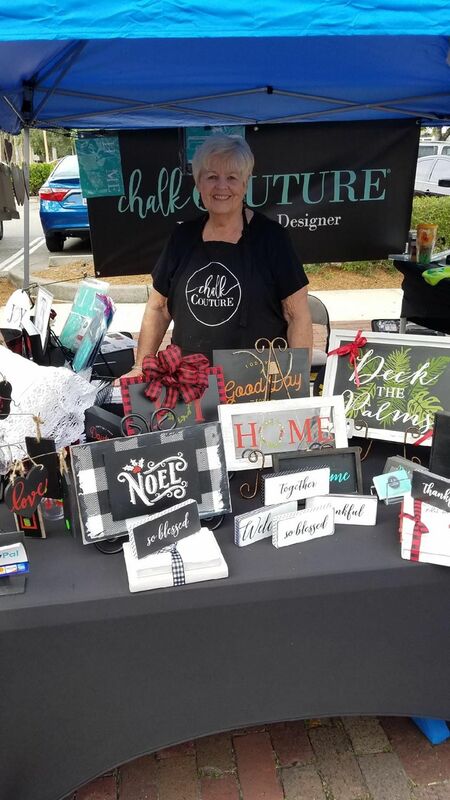 This is our booth downtown Fort Myers last Saturday at small business Saturday. Marcia and I had such a good time and got lots of good exposure. 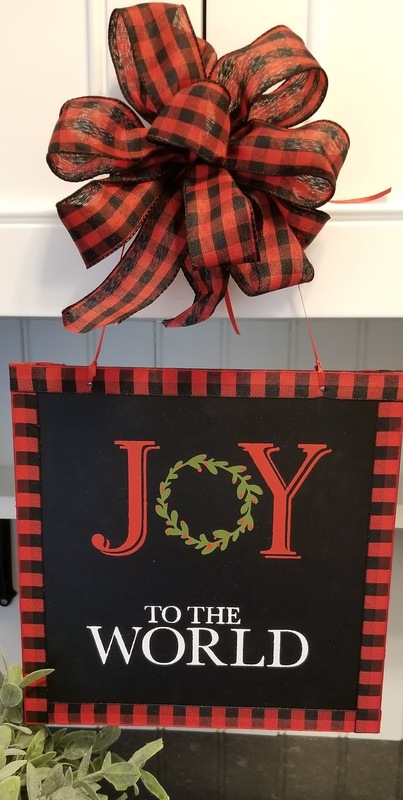 Tomorrow is the Craft Show in our Community, so I have been working hard to get everything ready. I still have a few more items I want to get done this morning. But, other than those items, everything is packed, priced and ready to take to the club house. Below are a few items that I will be selling. All of the items have been done using Chalk Couture products. Chalk Couture is so easy, that even young kids can do it. 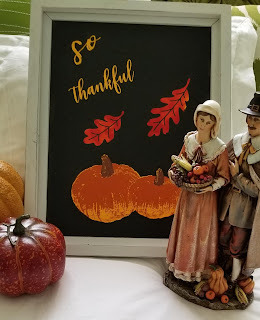 As we prepare to give thanks this Thanksgiving, I loved the 3 different Chalk Couture transfers I used to create this picture. 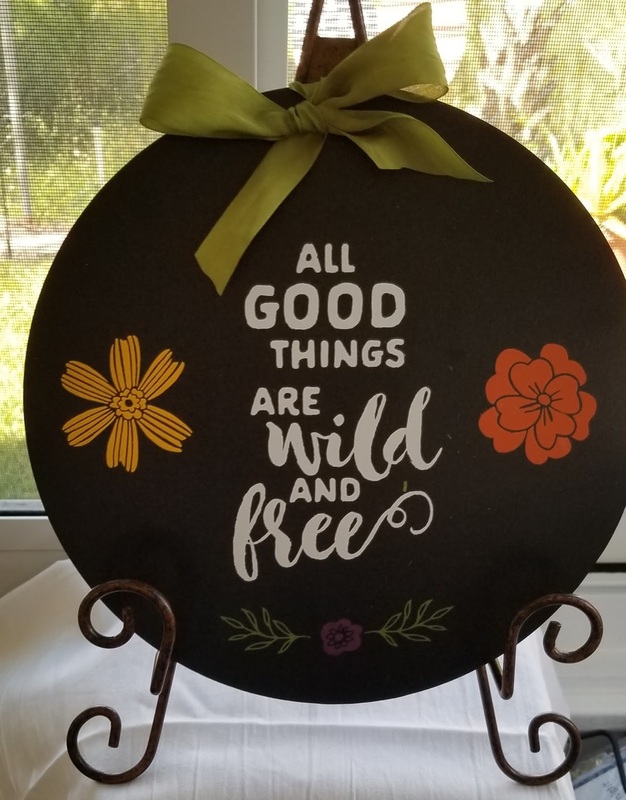 I made 18 of these little so blessed signs and the Joy to the World Transfer can look so different using different surfaces and colors. One of my favorite Chalk Couture Transfers. 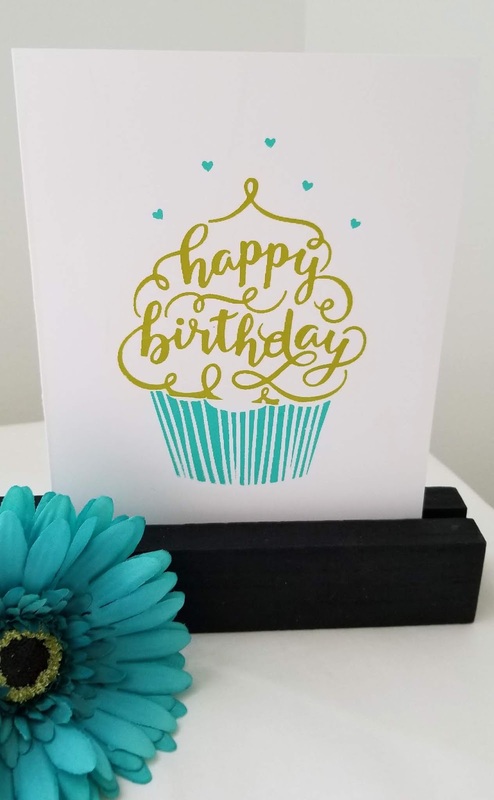 I created this card using Chalk Couture paste. I have 8 books that I have decorated as accent pieces. What is Chalk Couture All About??? You might need to click twice to start the video. 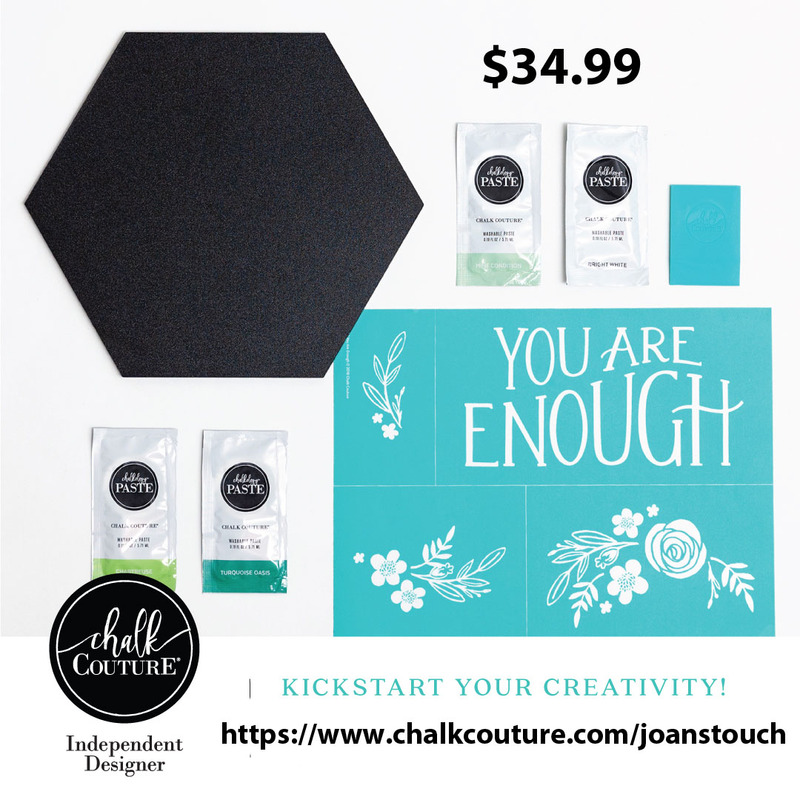 I have had several ask this question: "What is Chalk Couture All About:" I am including this video that gives you a lot of information for either becoming a Customer or a Designer. I truly was just interested in becoming a customer when I question the gal in the Chalk Couture booth. 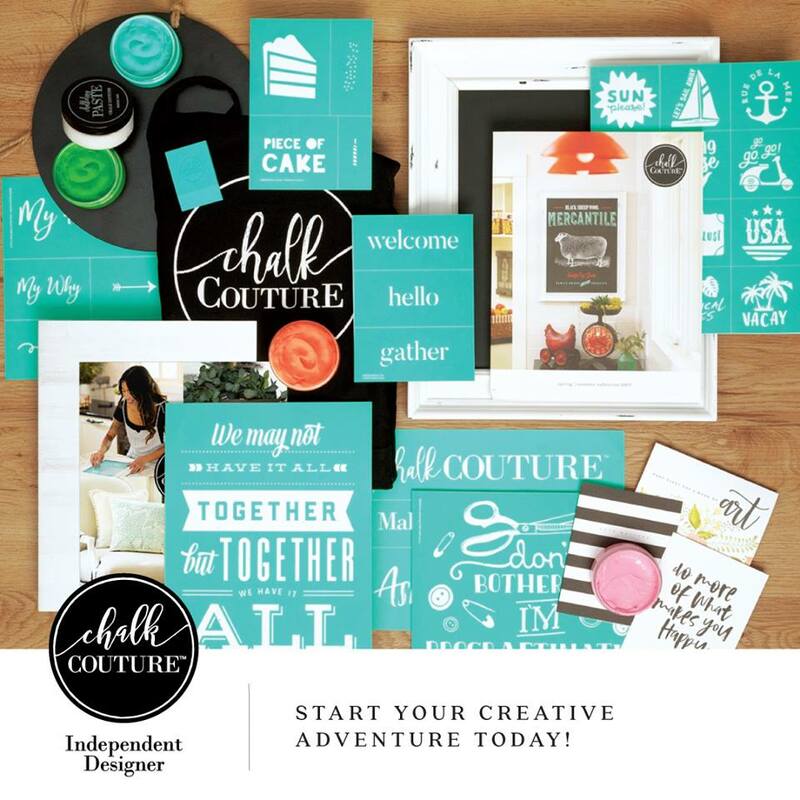 When ask her what it costs to become a Designer she said it was only $99.00 and I would receive $252.00 worth of products and accessories. Chalk Couture Products to do so. REMEMBER.....YOU CAN BE A CUSTOMER OR A DESIGNER, WHICHEVER FITS YOU NEEDS THE BEST. I have been busy this week being creative getting ready for our Communitie's Craft Show on Nove 17. 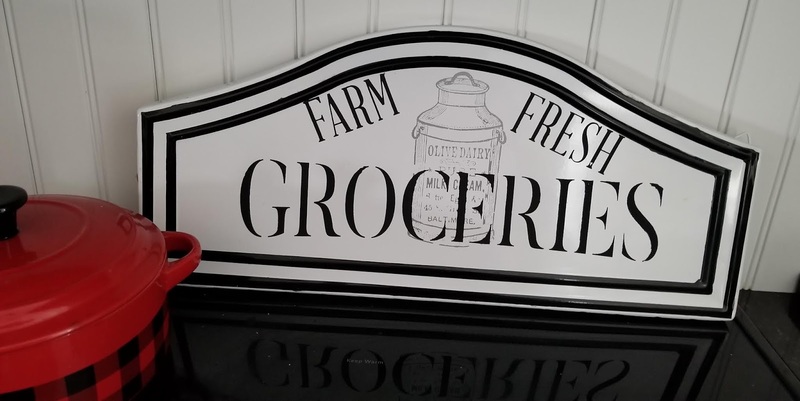 I designed the adorable Vintage Truck for my black and white kitchen. I have absolutely no artistic ability, so being able to design something like this gives me alot of pleasure. What makes it possible is Chalk Coutures Transfers and Chalk Paste. I am having so much fun. If you have any questions or comments, please leave a comment. We are having a craft show in our community in November and I have been decorating books for it. This is just one sample of what I will have. 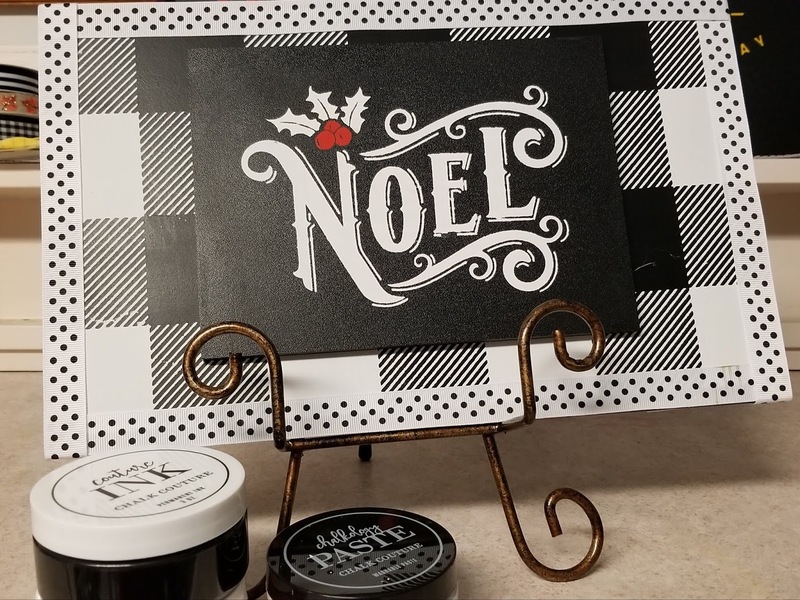 Also, I needed a very quick card this AM to send something to a friend who I wanted to show a sample using our Chalk Paste. This card took a matter of 2 minutes from start to finish. I could have done lots more, but I am just showing the paste. I am so excited that it works on card stock as well as boards, painted picture frames, windows, etc. The wonderful thing about the paste is I can take water and wash it off. (not on card stock of course). With limited storage here in Florida that is a great benefit. I have been busy organizing my craft room to make room for my new Chalk Couture items. 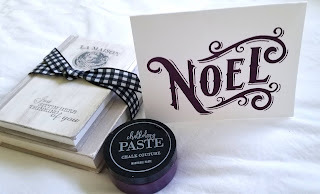 Today I wanted to try our Chalk Paste on a card and oh my I must say it is fantastic. Everything on this card is Chalk Couture paste and so easy. Our reusable Chalk Transfers are an adhesive silkscreen that can be used on chalkboards, card stock, windows, mirrors, tile, whiteboards, appliances, painted furniture, apparel, pillows, and so much more! They are your imagination’s best friend and can be reused an average of 8-12 times (depending on care and surface applied to). 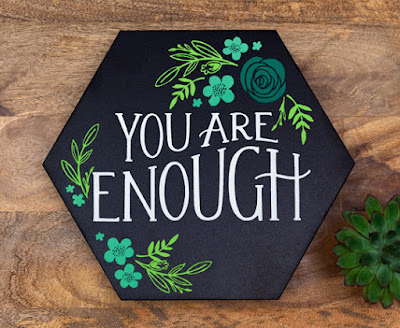 There are hundreds of designs to choose from, allowing you to create a design or decor item for any type of style, space, or celebration! 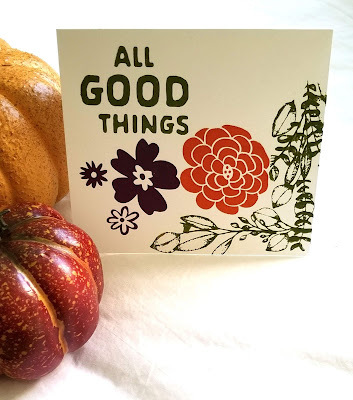 I wanted to experiment with this card using only paste, but you could add any embellishments, layers etc. How fun it can be. 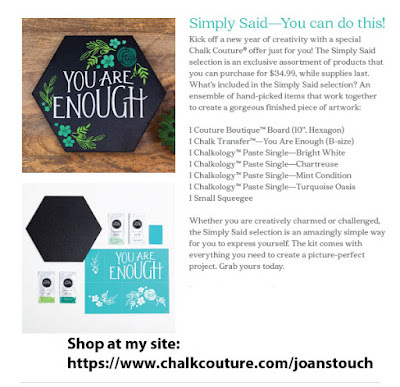 If you would like to know more about Chalk Couture, please email me at jfricker@fourway.net call me at 574 514 1423 or click https://www.chalkcouture.com/joanstouch which will take you right to my website. This new product is so exciting and opens so many doors. Yesterday my good friend Marcia and I unpacked my new Chalk Couture products and chose the board, transfer and colors of chalk paste to use. I love our transfers as they are sticky with mesh which keeps the paste from bleeding. The transfers can be used 8 to 10 times if not more. Would you like to make some beautiful Christmas gifts? Do you need birthday gifts? Do you want some fresh decor for your home? Chalk Couture makes this all possible.